Reach peak workplace tidyness with Savannah Kurka’s alpine skyline desk organizer, handmade of birch. 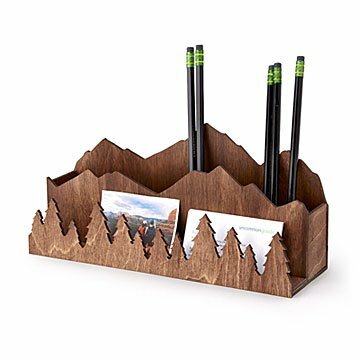 Reach the summit of workplace tidiness (and look busy while daydreaming about your next alpine hike) with Savannah Kurka's mountain skyline desk caddy. Laser cut of US-sourced birch, it's especially inspiring sitting next to your computer monitor. Two jagged mountainscape-backed compartments, with a line of evergreens in the front, hold documents, takeout menus, writing utensils, art supplies, and those as-yet unperused spreadsheets. Handmade in Denton, Texas. Savannah is based out of Denton, Texas. She fell in love with the process of laser cutting while attending the University of North Texas for Visual Art Studies. During her senior year of college, she decided to take a leap of faith and invest in her first laser cutter. She grew up working with wood so it felt like a natural next step. Every spare second between classes & work was spent experimenting & creating. She still design, laser cut, and assemble all of my products in house.Through Savvie Studio, she aims to celebrate life, nature, & the spaces that we share with those we love. I aim to create goods that spread happiness and boost confidence through modern, energy-filled designs. In a world of mass produced goods I find great joy in making the artist's hand evident in every piece; and find hope in the community that handmade goods create. Wipe down with duster or microfiber cloth. Design was flimsy and the trees in the front were not attached, so now I have to glue them on myself, which is frustrating since I paid more than $40 for this gift. Use in husband's den. Both great design and functional. Used as a desk organizer for an architectural drafter. Fits pens perfectly, and the front slots hold scales (rulers). Very attractive design, beautiful craftsmanship. I am assuming he is going to use it at his desk at work. He loves rock climbing, so I thought this was a perfect fit. My sister uses on her desk at home.